Forest Town Rangers Football Club was I believe the brain child of Mr Reg Ball (not Brudder), with the help of George Roades, Jack Percival and Ben Burton. 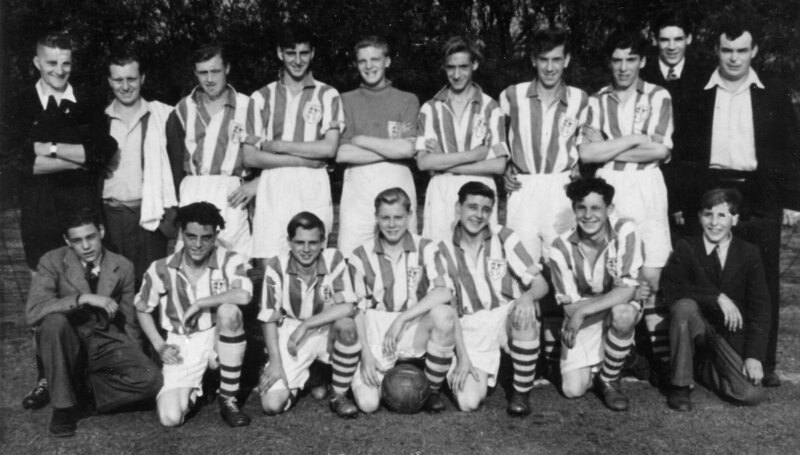 1947-48 was our first season in the North Notts. 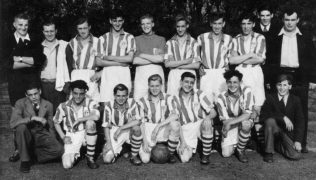 (Under 17s) league and I think the first team to play was Goal – Tommy Brown, Full Backs – Roy Gibson and myself (Lebe), Half Backs, Colin Bennett, Dave (Nobby) Knowles and Ron Jelley. Forwards were from Right Wing, Peter ( Ticker) Blake, Barry (Shadow Man) Kingswood, also known as ‘Konk’, Ian (Tweet) Wheatley, Benny Simpson and Geoff Piggin. Others involved were Brian (Tiny) Tyers, Ted Swaby and probably some I don’t recall. Our home games were played on the field at the top of Kingsway, I think it was part of Vincents Farm, and our dressing room was the old Tin Chapel. Although I don’t recall us winning any cups, we were always well up the table. The following year was in the under 18s and again we did quite well, some of our opponents were Bilsthorpe, Skegby and Bradder Street, (we never could beat the latter). I seem to recall that after some dispute with the management several of us defected to play for Mansfield Colliery. In the March of that season I went to do my National Service so that is about all I can remember. Back row Left to right – ? (Ref), G Rhodes (Trainer), Roy Gibson, Dave (Nobby Knowles), Tom Brown, Barry Kingswood, Geoff Piggin, Dennis Lebeter, Ben Burton, Reg Ball (Manager). Front row Left to right – Brian Tyers, Peter Blake, Colin Bennett, Ian Wheatley, Ron Jelly, Ben Simpson, Dennis Swaby? These memories written by Dennis (Lebe)Lebeter were first published in the Forest Town Crier, June 2004. Is this the Reg ball who had a son Reg and 2 daughters Margaret I think she was married to some one called Peter and Muriel. Lived in no 7 Fourth Ave.